Based on my last film, Alice’s Adventures At Black Rock, this film is set twenty years later in the setting of a psychotherapeutic relationship where the main character, Ali, confronts the past and realizes that the blame for the sexual abuse she experienced in childhood lays with her uncle, allowing her to stop taking responsibility for it. This is a blog post about the making of the Fred Astaire dance scene in the revolving room in the film Royal Wedding (1951). This is a blog post about the making of the Fred Astaire dance in the revolving room in the film Royal Wedding (1951). A rough edit of the film I’m making for the Fictions brief at uni. It shows a conversation between Ali, played by me, and her psychotherapist, Howard, played by Chris Read. It’s intercut with footage from my last film, Alice’s Adventures at Black Rock, and footage we shot tonight showing the sexual tension and transference between client and psychotherapist. This is a roughly edited opening sequence to my film for the fictions brief. I used the end from the telecined 16mm film to overlay the image from the DSLR shot, whilst the sound remains from the DSLR footage. The film begins with a white screen, but it’s not pure white – there is some flickering. After a second or two, the colour begins to flicker. I’m going to make a title to overlay these first frames. The sea flickers into view. This is the scene from Alice’s Adventures at Black Rock where there is complete silence after Alice remembers the sexual abuse committed by her Uncle. The sea is stormy. I think this is an important way to open the movie – if you haven’t seen the previous movie you wouldn’t know why it was there but it does lend an air of coldness with its blue tint and stormy weather; the warm yellow of the room in which Ali is sitting to talk about the abuse contrasts with the cold blue of the 16mm film. 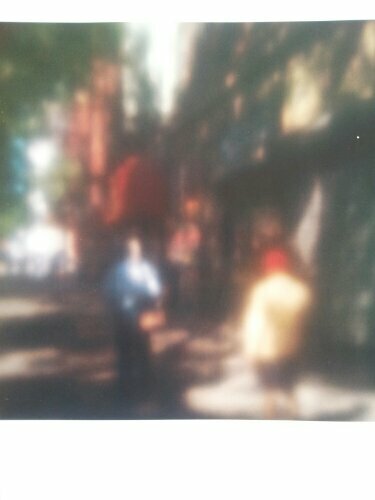 This is my photo of a photo by the artist Bill Jacobson. By softening the focus the image becomes slightly abstracted allowing the colours and shapes to become dreamy. This is the sort of look I’d like to achieve in the dream sequence of my film that, hopefully, we will shoot tonight. The image comes from Eyemazing, Issue 02- 2007. To begin with, I played Ali and Sarah played Howard. I arranged two chairs in the space and stated I wanted us to workshop the piece I’d selected to work on to see what actions arose from reading the script through several times. This meant I wasn’t bothered about lighting the set or working out camera angles. I wanted to jump into it and get on with it because I was feeling self conscious and very exposed. Surely now, everyone would see how incompetent I was? After reading through it once, Matthew stopped us and asked which bits we were reading. He only had the first page and I had decided, that morning, to work on a part that started on page one and finished on page two, but I had omitted to let Matthew know this. Matthew requested the rest of the script so that he could photocopy it and suggested that someone else play Ali so that I could film. Perhaps by observing from a distance I might get more out of it. I agreed. Sarah would play Ali and Edmund would play Howard. While Matthew photocopied the script I talked to Sarah and Edmund about their roles, gave them the background and what I was looking for in their interactions. I took the camera off the tripod and set it up for the lighting conditions. Feeling very nervous, I wandered around the set, looking through the camera to see what worked. I realise now I was trying to do too many things: watch the actors and work out camera angles at the same time. I got on the floor, postioned the camera and said, “action!” The floor position didn’t seem to work so I moved in closer and we ran through the script a few more times before Matthew called a halt. He said, because this was a workshop environment we needed to include the other people and get them involved; what was currently happening was I was working stuff out with Sarah and Edmund and the others were either watching or looking at their mobile phones (surely it’s down to them to become engaged rather than making me responsible for engaging them? ), so I suggested we light it and have a sound-person. I don’t fully understand the settings on a digital SLR but I know that if I press certain buttons, in such a way, I get a certain result. For example, ISO: the lower the number the less bright (indoors) and less noise on the image. I had begun turning down the ISO for the new lighting conditions when Matthew came over and instructed me not to have a high ISO and talked about metering. I was already feeling incompetent but this reduced me further and I felt embarrassed because I was already turning the ISO down. I felt that everyone in the room except me knew what they were doing. This is probably not true, and even if it is, so what? But it served to create a sense of alienation in me and I felt criticised by Matthew, who was now representing, in my mind, any authority figure who has, in the past, hurt me. These thoughts made me react with a defensive tone, rather than respond, to anything Matthew said. Matthew suggested it would be more powerful if the camera focused on Ali and her reactions to Howard’s words. As with the suggestion made by Chris the previous night, I could see this could work but felt an inner conflict – I’m playing Ali and that means it will be my face on the screen; my face is not classically beautiful, or even beautiful at all (it’s weird-looking and non-symmetrical), and whilst I often despise the media’s representation of beautiful I guess part of me aspires to it (if you receive the same message over and over and over again you’re going to internalise it, surely? It would take an incredible amount of energy to challenge it every time it’s in your face). However, my desire to make good art is stronger than my desire to avoid having people laugh at my weird face, so I moved into position behind Edmund, received his permission to rest the lens on his shoulder since the camera was feeling very heavy now, and trained my focus on Sarah’s face. After filming from this angle, Matthew asked me if I had feedback for Sarah. I did. I asked her to put more movement into the line “like I want to fall into your arms and hold on forever.” [The following is my reflection on the script today, not what I said yesterday] A couple of lines before this, Ali has really noticed how much Howard looks like her uncle, and she feels sexual desire towards him because this was a feeling she associated with her uncle and with feeling loved. As she delivers this line she reaches out to touch Howard and her eyes shine with intensity of longing. She wants to re-create those intense moments with her uncle. Howard feels this intensity of desire coming from Ali and it is alluring and inviting. It takes all his psychic strength to remain boundaried in these moments and it is this strength that allows Ali to begin to accept herself. Howard doesn’t dismiss her invitation and, similarly, he doesn’t collude with her – instead he responds without judgment of her. A beautiful dance is created through these subtle interactions. Matthew also had feedback for Sarah. He stated Ali would feel triggered by some of Howard’s questions and remarks; could she show more emotional reactions to Howard’s interjections? When Matthew said this I felt a mix of emotions. His understanding of Ali was spot on and, already hyper-sensitive, I wanted to cry. Also, I was feeling slightly triggered. I had, already, told Matthew I’d zoned out when he was showing me something on the camera and asked him to repeat what he’d said. Not only had Matthew clearly seen into Ali, I felt he’d seen into me and I felt naked and exposed. I’m pretty certain there’s a fair amount of transference going on for me with Matthew. I also believe that the nature of the film that is being made shows up in the process of filmmaking. In this sense, Matthew is like Howard, if I am like Ali. Despite my often defensive tone, Matthew stays calm and continues to ask me questions and treats me with respect. I feel very honoured by his treatment of me. With more movement from Sarah, I realised there would be an issue with the focus on the camera. Matthew stated that as Sarah came closer to the camera, I would need to adjust the focus in shot. While shooting my last film I’d made a rule for myself not to touch the focus while shooting because I tended to ruin the shots. Matthew said it was a matter of practicing and knowing which way to move the focus ring; he took over the camera for the next shot and I stood nearby and watched Sarah. This was incredibly powerful. For the first time, my only role was director. It gave me the opportunity to focus solely on the action. Rees was incited to take over the camera and we did a couple more takes and then stopped in order to work on Ezra’s film. After sitting at the back of the room, feeling very highly strung, I escaped to the toilet and cried. When I came back I still felt out of sorts. I guess this is a natural reaction in response to the stuff I’m dealing with while making this film. I learnt a lot about myself as a filmmaker at the workshop. It’s been incredibly important to me to keep control of all areas of my films but it’s much more powerful to let go of control and allow others to help so that I can focus my attention where it needs to go. Today I telecined the footage I captured on 16mm black and white film. I’m going to use it in the edit of the film I’m making for the Fictions brief. We also workshopped a scene from Ali and Howard, the script I wrote for the Fictions brief, in a workshop at uni. It was very useful because I watched an actress play Ali – I asked her to put more movement into it each time and saw what I needed for the filming we’re going to do on Thursday. The scene is where Ali transfers sexual desire for her uncle onto Howard, the psychotherapist, and he counter-transfers whilst keeping his boundaries. This is a scene in which I play Ali during a therapeutic conversation with her psychotherapist, Howard, played by Chris Read.